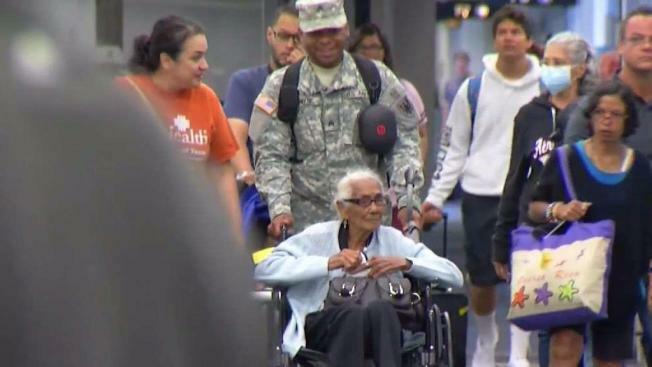 NBC 6 Reporter Laura Rodriguez is at Miami International Airport, where a 103-year-old woman arrived in Miami from Puerto Rico, escaping the disaster after Hurricane Maria. With thousands still living in dangerous conditions in Puerto Rico, many have escaped the disaster, including a 103-year-old woman. Angela Parrilla arrived in Miami for the first time ever Sunday afternoon. Her grandniece tells NBC 6 she loves Puerto Rico and does not leave the island often. Relatives knew they had to get Parrilla and her special needs granddaughter out of Puerto Rico. Parrilla has a visual impairment, a blood disorder and a heart condition. Parrilla lives in Vieques and had been living without power or running water for weeks. It took a team effort to get her out of Puerto Rico, starting with a nurse on a humanitarian mission from Texas, who found out about the 103-year-old through a Facebook message. Parrilla’s grandniece said Sen. Marco Rubio’s office helped organize a helicopter ride from Vieques to San Juan, and then Parrilla made it to the mainland on a plane chartered by Puerto Rico Hurricane Relief Fund. “I needed to get them off the island. It was totally impossible to get a flight out. I called and pleaded,” said Zandra Velez, Parrilla’s grandniece. Angela’s trip didn’t end in Miami. Her family lives in Orlando, and will be spending time with them. Velez told NBC 6 she has two more elderly relatives in Puerto Rico and is concerned about them.